Visibility multiple dates - recommended for reports where you want to show the trend of your visibility in the search across a period of time. 2. Visibility date comparison - recommended for reports focused on a particular date, compared to a date in the past. The connector requires an AWR paid account with access to an API key. The Developer API is available for monthly subscriptions starting from the Agency level, and for all yearly subscriptions. If you do not have an API key yet, please visit our Pricing page. 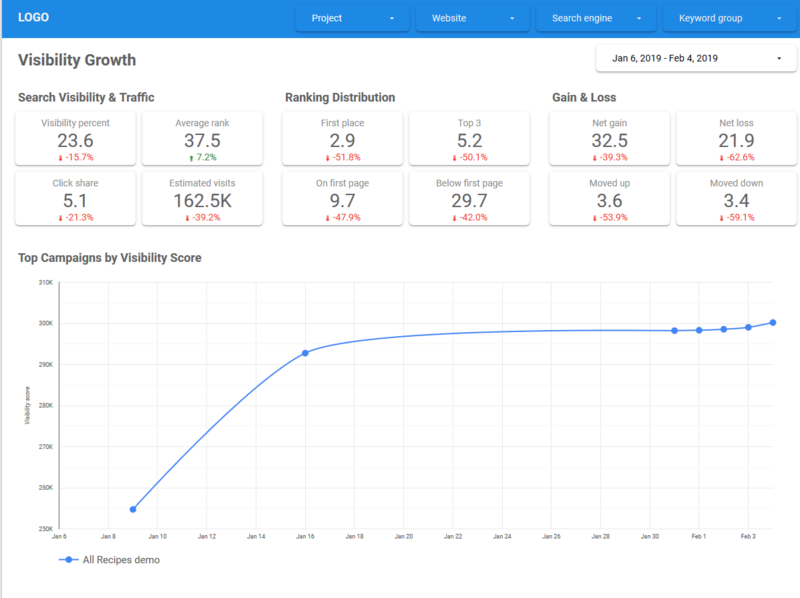 Visibility Score - Sum of visibility points assigned for each of your Top 30 keyword positions. 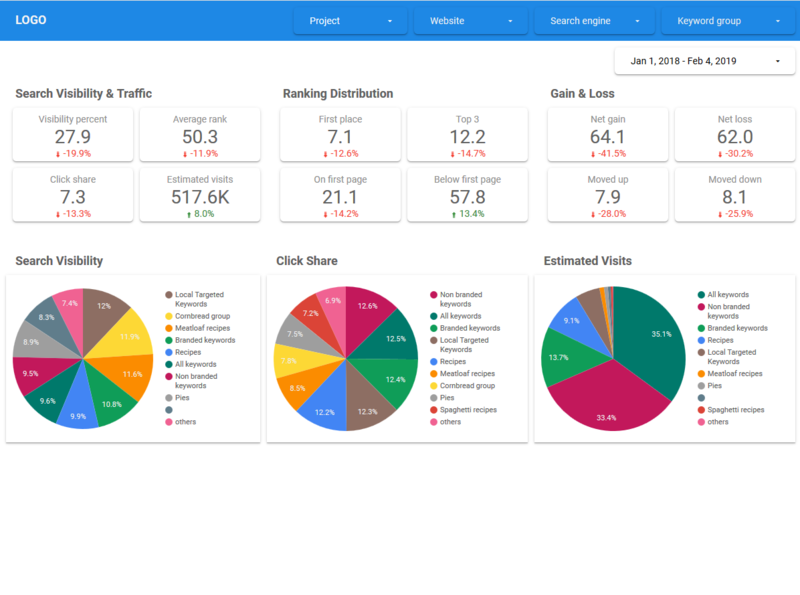 Visibility Percent - Search visibility performance based on the Visibility Score, benchmarked to the maximum possible value (100%). Average Rank - Sum of all your keyword positions divided by the total number of keywords. Click Share - Estimated percentage of clicks that your website may receive from Top 20 keyword positions. Estimated Visits - Estimated traffic that your website may receive from Top 20 keyword positions, based on keyword search volume. On First Page - Number of keyword positions your website has on the first page of the SERPs. Below First Page - Number of keyword positions your website has in the SERPs, but not on the first page. Ranked - Total number of keywords for which your website is listed in the SERPs. Not Ranked - Total number of keywords for which your website does not have a ranking position. First Place - Number of keywords for which your website ranks on position 1. Top 3 - Number of keywords for which your website ranks on positions 1-3. Top 5 - Number of keywords for which your website ranks on positions 1-5. Top 10 - Number of keywords for which your website ranks on positions 1-10. Top 20 - Number of keywords for which your website ranks on positions 1-20. Top 30 - Number of keywords for which your website ranks on positions 1-30. Moved Up - Number of keywords with higher ranking positions. Moved Down - Number of keywords with lower ranking positions. Added - Number of keywords for which your website started to rank. Dropped - Number of keywords for which your website is no longer ranking. Net Gain - Sum of keyword positions that moved up. Net Loss - Sum of keyword positions that moved down. 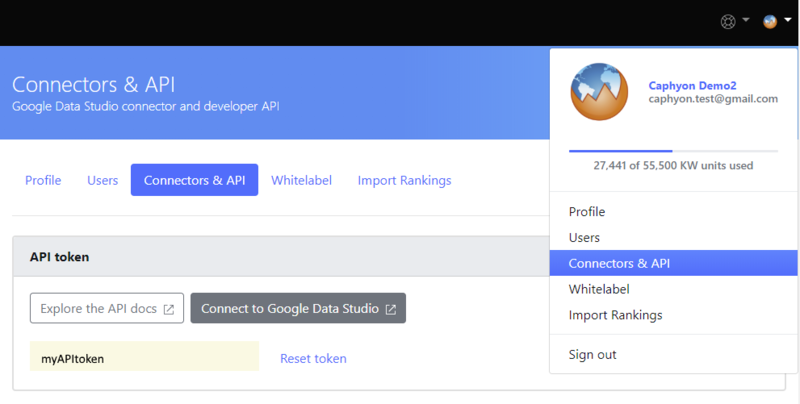 To add AWR as a Data Source, navigate to Account Settings - Connectors & API and click on Connect to Google Data Studio. Enter the project name that you want to connect. If you want to merge data from multiple projects to the same report, then you can filter the projects by name with partial match, or by project tag. Then just add a name for your data source and click Connect. Once the new entry is created successfully, it will list the mapping options for the metrics and dimensions available, giving you the possibility to update the type, aggregation and description for each filed. From this step, you can further create a new report based on the newly created data source, or you can add the data source to an existing report.